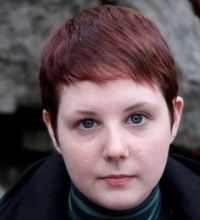 Wren Hanks is the author of Prophet Fever (Hyacinth Girl Press) and Ghost Skin (Porkbelly Press). His recent work appears in Best New Poets 2016, Gigantic Sequins, Drunken Boat, Jellyfish Magazine, and elsewhere. A 2016 Lambda Emerging Writers Fellow, he lives in Brooklyn with his wife, their cats, and a pair of hermit crabs. “The Witch Gathers Materials” & “gar child” in Stirring. “gar child tells it in first person” in The Boiler. “So Many Mouths” & “The Witch Says Plan It” in Hermeneutic Chaos.